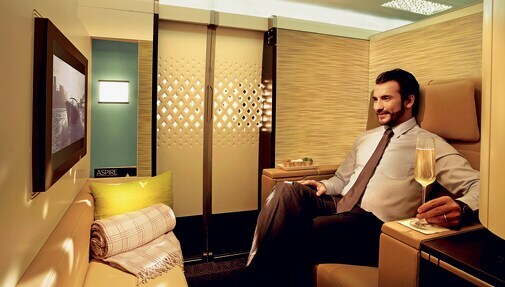 Fantasy flights of The Etihad Airways' business class is an exercise in indulgence. Flying is believing. Skimming the underbelly of clouds while watching the first rays penetrate an ombre sky could once put even the taciturn Howard Hughes in a chipper mood. Decades later, our flight experiences have evolved to encompass a range of human emotions, primarily irritability and boredom. Long-haul flights have become the ultimate test of human character, where attempts to keep up a semblance of polite amiability comes under severe strain. Indeed, our modern day heroes are the fliers who slumber through periods of air turbulence, suffer little or no loss of appetite, and finally hop off the flight without the slightest trace of jetlag. But while there are few things as torturous as being strapped to an airline seat for 16 straight hours, let's not dismiss the joys of flying just yet. With flying becoming the world's most preferred mode of travel, at least in the international arena, airliners are now pulling out all stops to ensure that customers reach their destinations in style. Don't believe us? Ride the open skies in the business class of Etihad Airways, UAE's national carrier, for an experience that will lend you wings. Quite literally. From the smallest details to grand gestures, the insides of Etihad are designed to please the frazzled flier and the sanguine snoozer. There are ergonomic curves, upholstery that's just the right mix of bouncy and soft, pleasing colour tones, and a flatbed seat. The stuff of dreams. What works An amenities kit containing everything you may need for a good night's sleep and your very own cocoon of privacy will turn you into one happy camper. The cushy corner is prepped for some serious in-flight entertainment. Sit back and enjoy the latest flicks on your personal 15-inch LCD screen while munching on Swedish crisps with a platter of cheese. The flatbed seat has massage points, and comes furnished with a warm blanket and cushion. What doesn't The onboard temperature may pose a glitch. We sat through a little-too-warm flight that kept sleep at bay. Movies and greasy pepperoni pizza are admittedly a match made in heaven, but how about tweaking the rule a little? 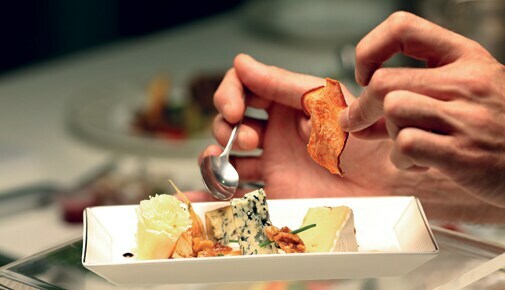 Curated by award-winning chefs, the gourmet meals onboard are a joy unto themselves. What works The grilled fish fillet in lemon sauce, perched on a bed of minted peas and potato wedges, paired with your favourite red wine. The panna cotta layered with carrot and mango coulis has a refreshingly Arabian twist tempered with whipped cream. Wake up refreshed to a breakfast of baked eggs with tomato hollandaise, sautÃ©ed spinach, a croissant and turkey rashers. A dash of balsamic vinegar in olive oil makes for a lovely dipping sauce. The cinnamon brioche with baked apple is another must-try. What doesn't Bigger seat trays might be a good idea because the generous portions threaten to spill into your lap. While grown-ups will lap up the five-star meals, kids may not be impressed. Instead, a kiddie-sized menu with more decadent options could make the tiny high fliers happy. The final touch on airborne opulence comes in the form of a three-room private suite, the first ever in commercial aviation. A royal affair that you won't forget in a hurry, The Residence by Etihad is set to be launched this month. And from what we hear, it's all booked out. What works A sumptuous cabin with a 32-inch flatscreen TV, an Ottoman, a table laid for two, and a drinks cabinet. Available exclusively on the Etihad Airways A380, the service includes a lavish breakfast in bed made by the inflight chef. And there's your very own flying butler who combines the roles of concierge and maÃ®tre d'hÃ´tel. What doesn't The one-way price tag of »12,500. Expectations are high, and will the uber-exclusive service live up to the promise? Happen to be on a stopover flight? Don't despair. 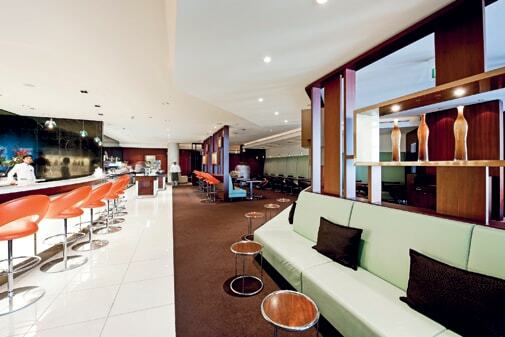 The Pearl Business Class lounge is your best bet to shrug off the effects of jetlag. What we liked was the option of jumping into a hot shower and enjoying an invigorating neck and back massage. The spa quotient is rather high and the Six Senses Spa has quite a few treatments worth trying. What works While all business class lounges have a wide selection of dishes as part of their buffet, what we liked was the mix of hot and cold dishes on offer. The beverage selection was wide as well, and everything was presented quite stylishly. What doesn't The sofas in the lounge are comfortable but there is no space to actually put your feet up and snooze if you have a long wait between flights. Lying down is clearly out of the question. The prayer rooms also look a tad neglected.